My goal is to actually read 100 books this year (a goal I’ve set every year for the past few years but never quite hit), which means 25 books over the three months of summer. The trouble is that I always end up reading less when we travel and are on the go, and we’re about to spend 3 full weeks in Florida with my parents plus I imagine we’ll be making several trips to their new home in North Carolina after they move in July. So how much I’ll actually read is anyone’s guess. I have pretty eclectic taste, and although my wishlist comes from a variety of sources, it is heavily influenced by both Shaina and Anne. Since Anne has posted her amazing Summer Reading Guide as well as the books on her list this summer, I thought I’d share my list as well. There are currently 54 books in my Books to Read folder on my Kindle, which is a bit ridiculous, I know. I tend to go through my wishlist once a week or so and buy any that are $5 or less (my “buy now” price), which means the folder is filling up faster than I can read. I think it’s probably time to ignore that wishlist for a few months! I’ve included prices for the ebooks that are on sale, but Amazon’s prices change often and without warning, so be sure to double check the price before you buy. Also, the links below are affiliate links; thanks for supporting Life Your Way! I avoided contemporary fiction for many years, but I’m finding myself drawn to contemporary young adult fiction more and more. Maybe I’m trying to hold onto my youth — ha! Written in the early 1900s, this book has dozens of reviews filled with words like charming and delightful, making it another perfect edition to my summer reading list! I’m a little late to the game in reading this bestseller! The first of a trilogy, just because I love dystopian! The sequel to If I Stay. The first wasn’t my favorite book so far this year, but I liked it enough that I want to know what happened next. I haven’t read John Grisham since high school, but I’ve always loved a good legal thriller. I’ve only developed an appreciation for fantasy in recent years, and this description reminds me a little bit of Graceling, one of my favorites. Another YA read, this time with a bit of science fiction. I’m looking forward to reading this one and Parallel one after another to compare and contrast the idea of parallel universes, time travel and how the choices we make affect the future. I read the first two books in this series years ago. I loved them, but I never picked up the rest of the series, which is hard to find for less than $10-$12 per book. Since I know I’ll want my girls to read these one day as well, I finally asked for the series for my birthday this year, and I’m excited to read through them this summer! Brain on Fire promises to be both terrifying and inspiring as Susannah Cahalan tells the story of waking up in a hospital idea with no idea who she is and the ensuing battle against the mental illness that stole her identity! I’ve had this on my list for a while. I love memoirs, and our family loves a good roadtrip and a chance to explore, so I’m excited to read this one as we travel this summer. Erin recommended this book while we were talking about this HONY photo/caption and how people sometimes slide into the wrong thing rather than actively choosing it. This is not a quick, easy read, and I’ve started it and set it aside on more than one occasion, but I’d like to finish it this summer. What can I say? I’m a sucker for books about homeschooling during the summer! Published by Classical Conversations, I’m reading this one instead of rereading The Core and The Well-Trained Mind again. I’m a marketing geek who loves psychology, and I’m looking forward to digging into both of these. Elizabeth recommended this while I was reading Jesus Feminist. As someone who struggles with a dual identity as a work-at-home mom, I’m looking forward to reading this perspective on success and a life that glorifies God. “The Power of Introverts in a World That Can’t Stop Talking.” Need I say more? I first “met” Brene Brown during her keynote speech about vulnerability at Blissdom several years ago. Daring Greatly expands on her vulnerability research and how it affects our work, relationships, parenting and more. In the second half of 2014, I hope to release several more digital products for Life Your Way, and I’m hoping this book will give me additional insight into creating products that really do serve our community! I’ve heard so much buzz about this book, and I’m excited to read it for myself! I have had a hard copy of Mere Christianity for years and never read it, but I’d like to finally prioritize it this year! I’ve read almost everything Maeve Binchy wrote, and Echoes is in my top 3 of her books. Definitely try to get to it and Bread and Wine! Oh, good to hear! I can’t even remember how that one got on my list, so it’s good to have someone confirm it’s worth reading! I started Where Things Come Back yesterday since I’ve already ready the first one. I think Bread & Wine will be my next nonfiction read after Daring Greatly! I also read The Measure of Success a few weeks back! I got it when I saw that thread on your FB page. It was really, really good! I struggle with the whole wahm thing, but I am definitely starting to feel more comfortable and confident in it. I really think it’s who God made me to be! The book is so good! I haven’t created a summer reading list yet. I just have my 2014 Reading List, but I feel like I keep veering away from it as I find new books to read! Right now I am reading Trim Healthy Mama, a book on menstrual cramps (fun, fun) and Lose Your Mummy Tummy (about healing a diastasis–which I’ve had since baby #3). I guess you could say my theme right now is female health. 😉 Haha–I am not reading these books anywhere near as quickly as I read those other two earlier in the month!! Is the Mummy Tummy one by Tupler? If so, her method works! I went from a 6 finger diastisis to a 2 and a half in a few months. Now I’m back to square one after pregnancy and I’m afraid to even check it right now! YES! That’s it! I did fit2b about a year and a half ago, and my diastasis started to heal, but I quit the exercises and now it’s at a 3. 🙁 I am tired of looking pregnant! My youngest is 21 months now! So I’m reading the book and may do a program called The Tummy Team and then try to maintain with Fit2B. I might be way off base, but I’m thinking I might have to continue the exercises always or it will just separate again? Yes–I for sure need to add a fun read! Secret Life of Bees is just wonderful. Was actually thinking of re-reading that this summer! I might just read that one next! All of the prices are for the Kindle ebooks from Amazon. If you click on the title of each book, it will take you right to those sales pages! 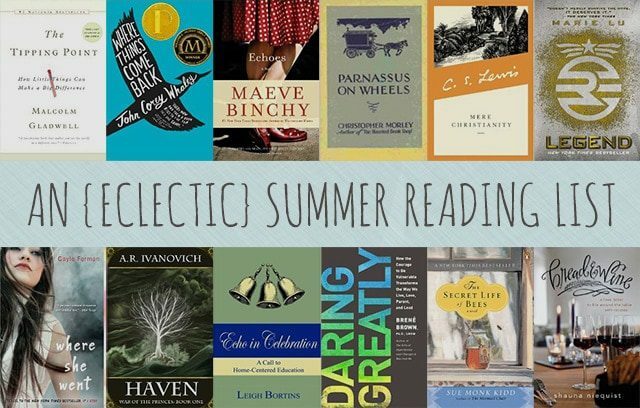 I don’t have a “summer” reading list per se as my life is pretty constant all year round, but I do have a few books that are at the top of my very long to-be-read list! First is Written in My Own Hearts Blood (affectionately referred to as MOBY) by Diana Gabaldon. This is the 8th book in her Outlander series of which I have been a fan for many years! Looking forward to catching up with Jamie and Claire. This book releases on June 10th. I am also trying to read more non-fiction. I read almost all fiction (and most of that historical). So I am trying to branch out. I just finished Unbroken by Laura Hilldenbrand, and I have started The Secret Rooms by Catherine Bailey. A friend mentioned the upcoming book in the Outlander series as the main book on her reading list as well! I’m afraid to look up Unbroken and The Secret Rooms for fear that they’ll grow my wishlist even longer, LOL! I’m notoriously bad about that too! Since I actually own most of these books, I’m going to try to stick to them this time rather than justify buying new books (our library doesn’t have a great selection of the latest books, so I rarely find them there!). I read the Little Britches Series to my boys and we all loved it! Mere Christianity is a very good read, but I found that if I was too tired or distracted, it was difficult in that it requires a bit of concentration and contemplation. Aren’t Kindles the best? I am so thankful for mine. It is so wonderful to be able to carry numerous book around in such a tiny device. Your reading list is very impressive, so I wouldn’t be too hard on yourself if you can’t read them all. Enjoy!